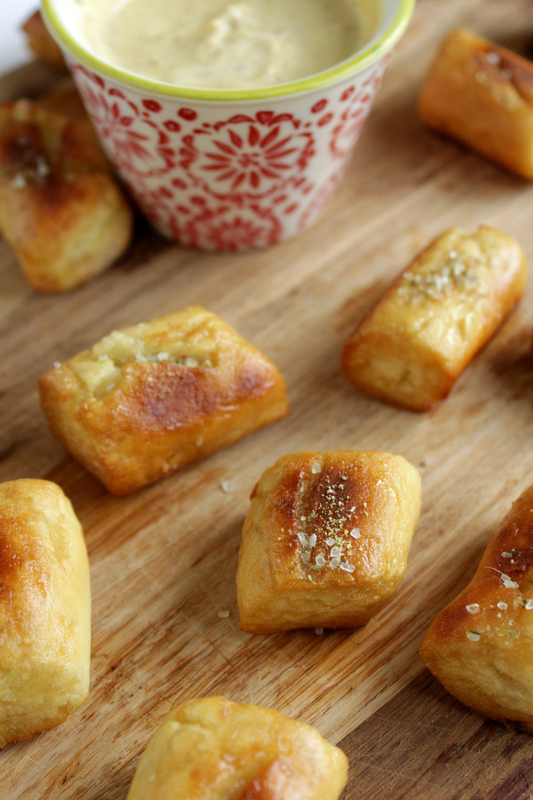 Perfectly chewy and soft, these pretzel bites are sure to be a hit at your next gathering. No one will ever know they are gluten free. In a large mixing bowl whisk together yeast and 1½ cup water. Let sit for 3-5 minutes until yeast starts to foam. Add in 2 tablespoons (warm - not hot) melted butter, sugar and salt. Whisk until combine. Add in 1 cup of flour at a time, stir until combine. Pour crumbly dough onto a parchment lined counter. Add one tablespoon at a time of the reserved ½ cup of water and work dough into a disc shape. Let dough sit for a few minutes and get a clean piece of parchment paper out. Cut dough into 6 sections. Remove one section, place on clean parchment paper and fold half of the parchment paper over the dough. Cover remaining dough with damp paper towel. Patiently working with the one section of dough, firmly pat and press dough between the parchment to form a 15-20 inch rope. If the dough is too dry add a bit of water with your finger tips to smooth it out. Cut rope of dough into 1½-inch bites and place on baking sheet lined with parchment paper or silicon mat. Cover bites with damp paper towel. Repeat with the 5 remaining sections of dough. Heat a large pot of water and pour the baking soda in. Bring to a rapid boil. Add about 8-10 bites to the water and boil for 20 seconds. Using slotted spoon remove the bites and place on baking sheet. Brush the beaten egg on each bite on all sides. Repeat with remaining bites. Bake in oven for 6 minutes. Remove from oven, rotate pan and flip over each bite. Bake for an additional 6-10 minutes. Start checking after 6 minutes and watch closely. Remove from oven and brush with remaining 2 tablespoons melted butter. Sprinkle with coarse salt. Serve with mustard dip or melted cheese sauce. This is the best recipe for GF pretzels I have found, and easily made vegan, too! They turn out great every time. Thanks Red Star!